Sam is a regular at our Tuesday Drop-In nights, supporting us in many ways like wrenching bikes as a Holiday Bike Drive Certified Mechanic, and truing wheels in the Guest Mechanic program. 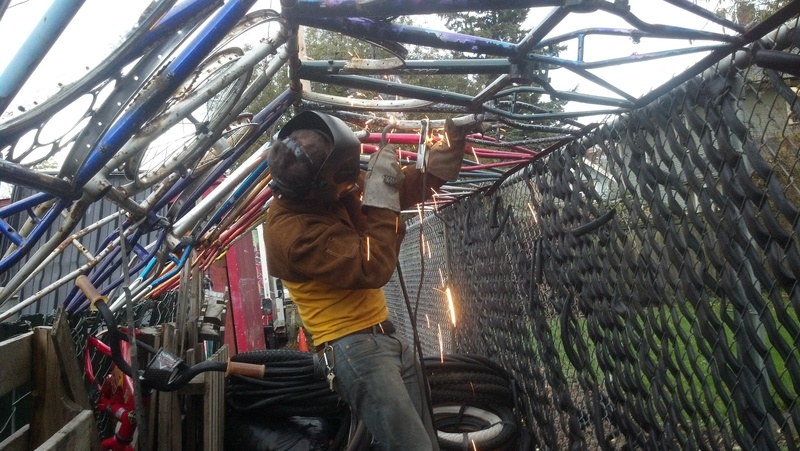 He is keen to soak up any knowledge about bike part compatibility and recently finished a welding project that resulted in a stronger lock system for the New Columbia Bicycle Repair Hub. A huge thanks to Sam, as he is an integral part of shop productivity, and consistently supports projects of all sizes, from labeling to fortifying our bike pen, to reliably finishing the crumbly mess at the bottom of a bag of Juanita’s tortilla chips every Tuesday night. I have been volunteering for about a year and a half. I was curious as to what this organization was about so I just showed up to one Sunday drop-in recycling and started tearing down bikes. I enjoy meeting and befriending all sorts of interesting folk from around the country and walks of life. Teaching others how to maintain a bicycle is an extremely rewarding experience and I still learn new things from time to time as well. Ultimately making a positive change in a community simply feels good. I try to make it out to the drop-in days as often as possible and I do an occasional bike collection as well. I have accompanied the Cycling Center to Cycle Oregon two years in a row which has been a blast. Lately I have been doing some welding projects for the shop, such as filling holes in the roof of the pen out back by reusing scrap parts that would otherwise be recycled. I would have to say the Holiday Bike Drive takes the cake. It is by far the most altruistic and positive program I have ever been a part of. My dream bike is an over the top classy road bike. The frame/fork would be an unpainted lugged stainless steel that is custom made to fit my specifications. Ideally there would be several builds of this bike. The speedy version of my bike would have mostly carbon components such as Zipp 202’s, an integrated seatpost/saddle, Shimano provibe bars, ax lightness cranks, a Modolo Kronos gruppo with downtube shifters, a Bruce Gordon lugged carbon stem, and a super record drivetrain. In homage to classic road bikes, I would build it with Shimano 600 Arabesque parts, light weight box section aluminum tubular wheels paired with FMB silk tires, and other obscure bike nerd things. I have always enjoyed exploring country roads by bike, and especially if the road happens to go up some huge mountain with a nice view at the top. And, of course, eating food. But then again, I like to do that at the Community Cycling Center, too. It would be called Easy Rider. It would feature me bumbling about the countryside on my touring bike slowing going from place to place. I have been told my looks are somewhere in between Zach Braff’s and Elijah Wood’s but I feel that Gary Busey would make this movie far more interesting than either of those two ever could.